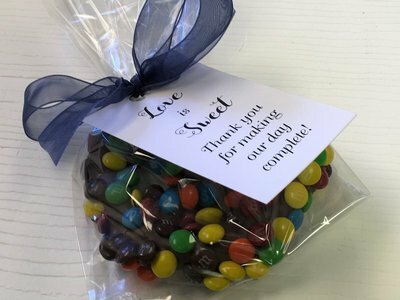 Weddings, Showers, Business Events -- any type of event -- Carella's has a favor to help make your event special! 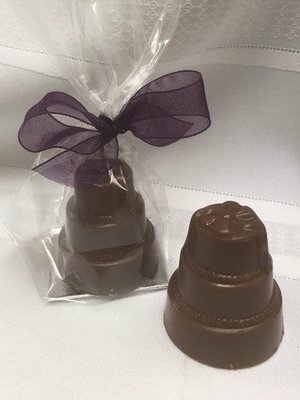 Milk Chocolate Wedding Cake, Bagged and Bowed. Peanut & Gluten Free. 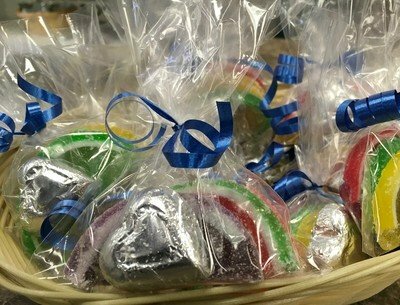 Boxed and Wrapped 1/2 Lb. 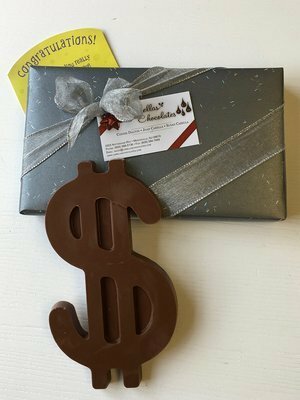 Chocolate Dollar Sign. Peanut & Gluten Free. Approx. 6"x4". 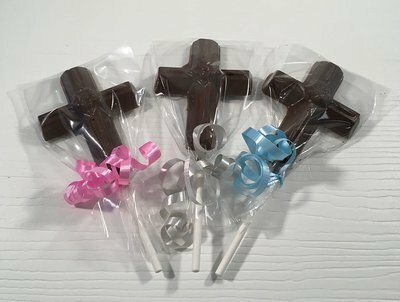 Cross Pops. Peanut & Gluten Free. Bagged and Bowed. 3 Lbs. 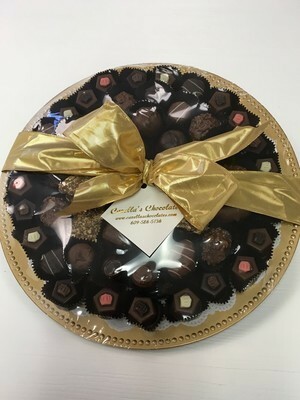 Assorted Chocolate Tray. 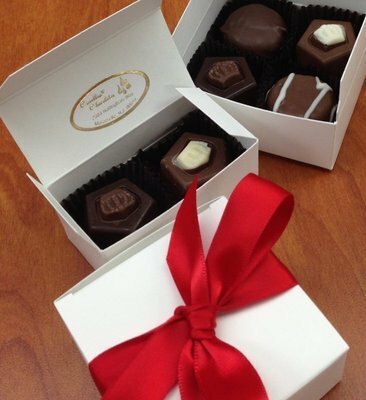 2 Piece Favor Box with Truffles. 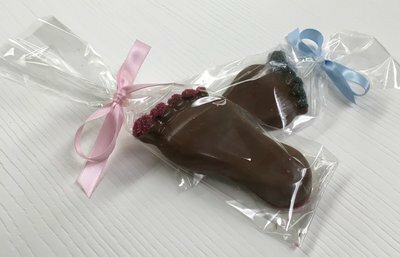 4" x 2" Baby Foot. Peanut & Gluten Free. 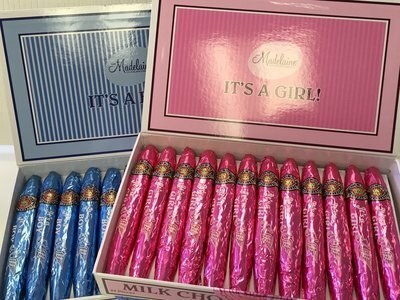 Choose Ribbon Color. 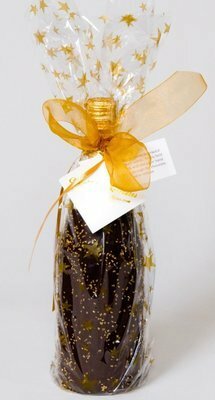 Martinelli's Sparkling Cider Chocolate Covered and wrapped in designer paper. 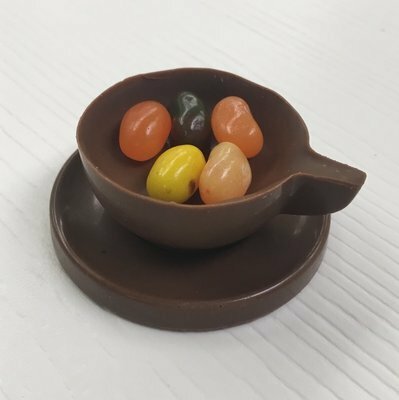 We dip in our Chocolate Kettle. 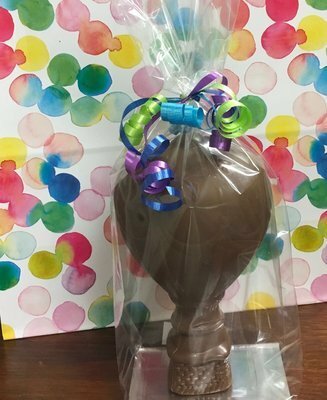 Chocolate never touches bottle. 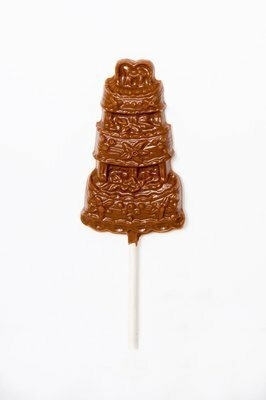 Easy Chocolate removal. Shipping Included! 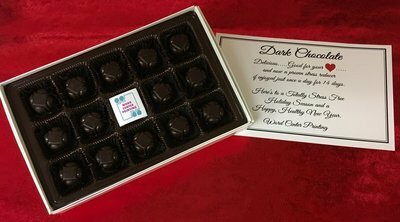 Chocolate Covered 8 ounce Beverage. 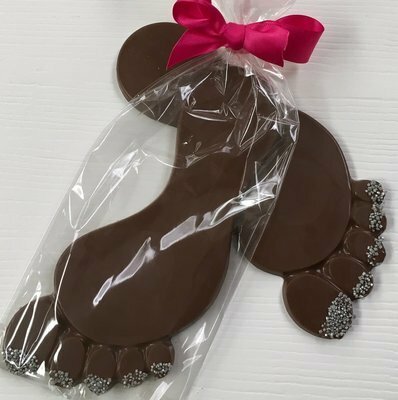 Easy Chocolate Removal. 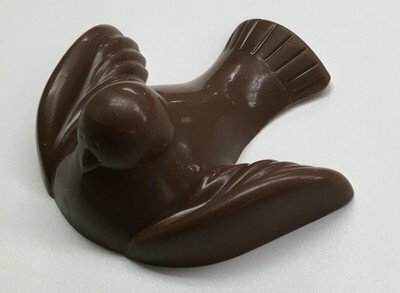 Hand dipped in our Chocolate Kettle. 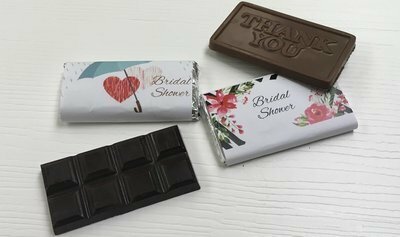 Tag not included..
Personalized Bridal Shower Chocolate Bars. 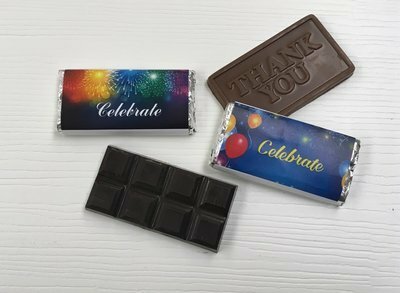 (Chocolate included) Choose Thank you bar or Chocolate bar. 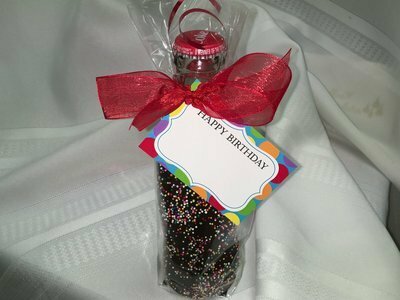 Celebration Chocolate Birthday Bars (Chocolate included). 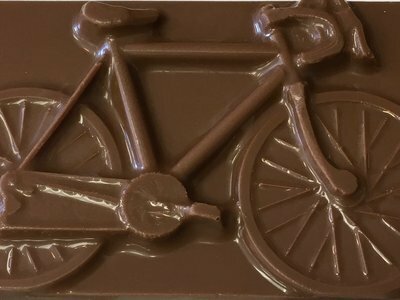 Choose from Chocolate Bar or Thank you Bar.Peanut & Gluten Free. 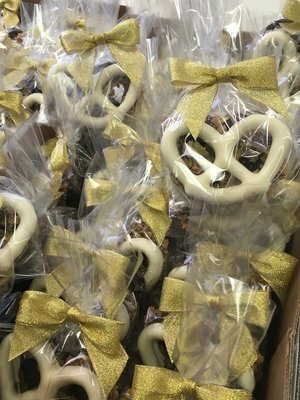 2 Piece 3 Ring Pretzel Favor bagged with Gold Bow. 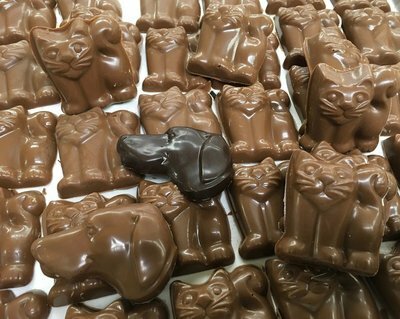 One White One Milk Chocolate. 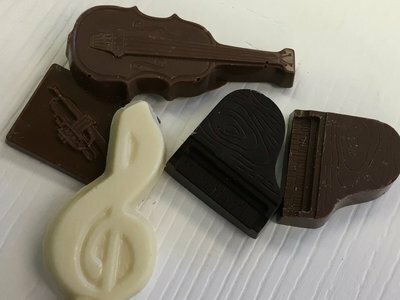 Mixture of Milk, Dark and White Musical Insruments. 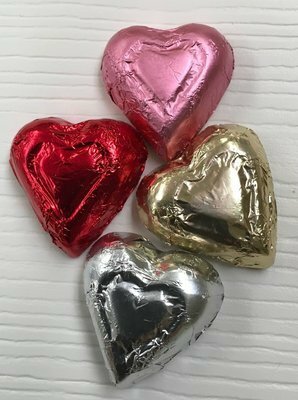 Solid Chocolates. 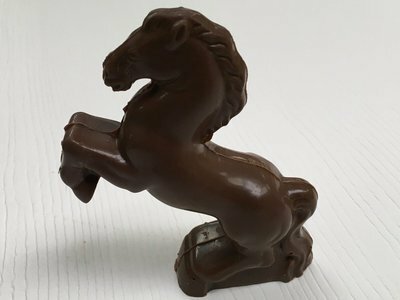 5" Tall Milk or Dark Chocolate Standing Horse. Peanut & Gluten Free. 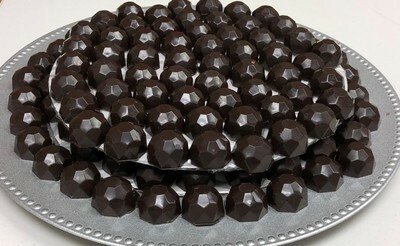 Milk or Dark Chocolate Diamond Chocolates. 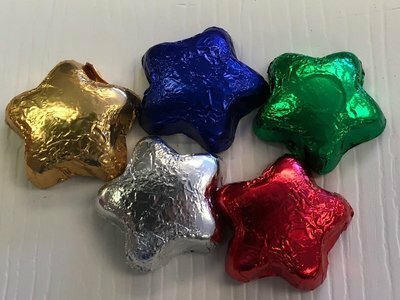 These solid Chocolates are wonderful. 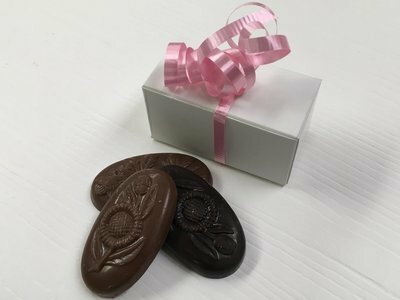 The shape and design of these chocolates allows them to shimmer in the light. Peanut and Gluten Free. 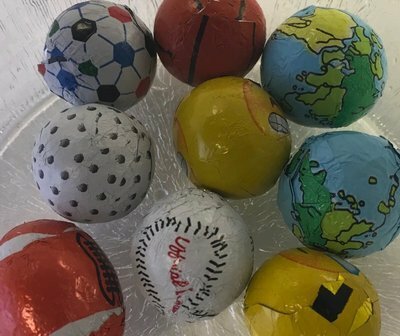 Made here! 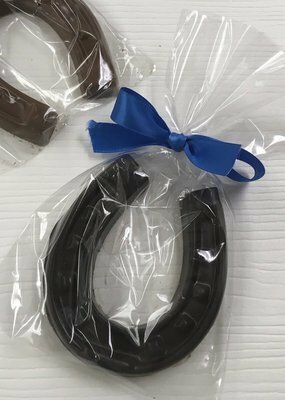 Lucky Chocolate Horsehoe. 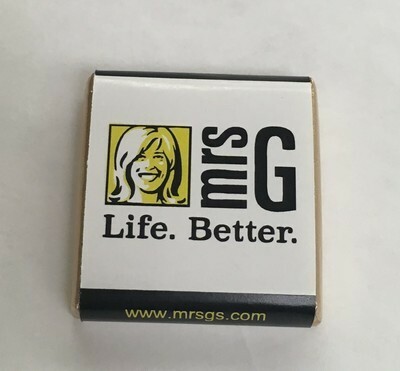 Peanut and Gluten Free. 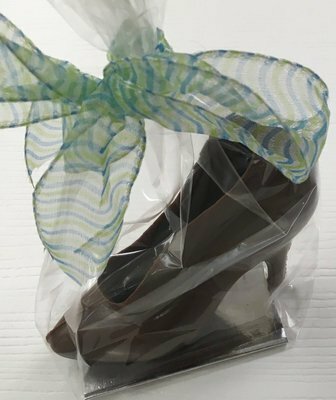 Large (6 1/4"h x 6 1/4"l) or Small (4 1/4"h x 4 1/2l) Chocolate High Heel Shoe. Peanut & Gluten Free. Please choose Size. 5 day pre orders over 3 shoes also call for extra shipping charges. 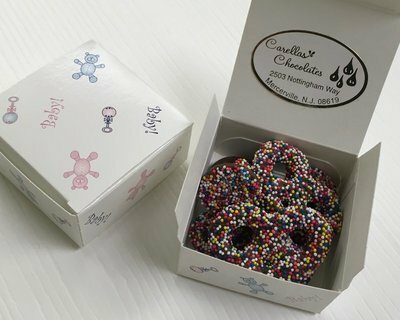 Baby Favors with 2 Milk Choc Mini Nonpariel pretzels and 6 Milk Choc Nonpariels. 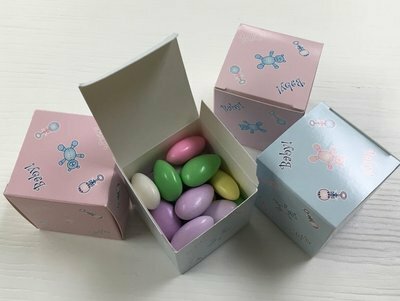 Box size 2 1/2"x2 1/2"x1 1/4"
2"x2"x2" Cube Baby Favor with Jordan Almonds. Choose color cube. 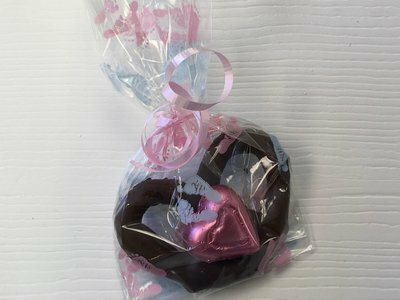 Single Milk or Dark Chocolate Pretzel w/Milk Chocolate foiled wrapped Heart. 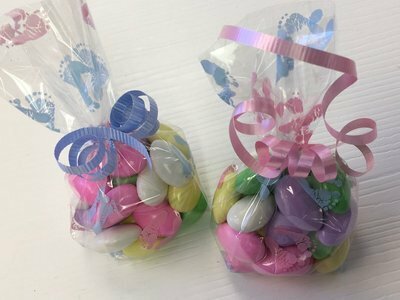 Baby foot bags. 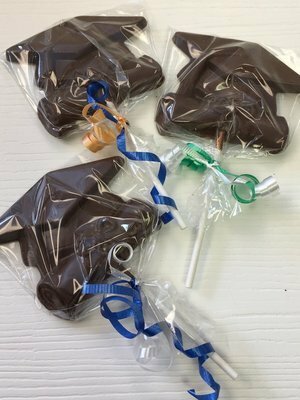 One Pound of Milk and Dark Mixed Chocolate Tools. Peanut & Gluten Free. 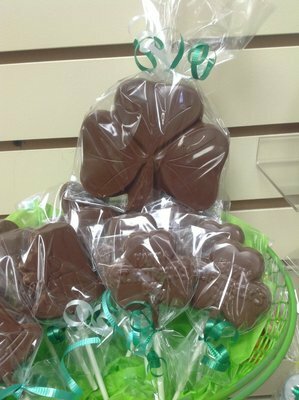 Large Chocolate Shamrock. Peanut & Gluten Free. 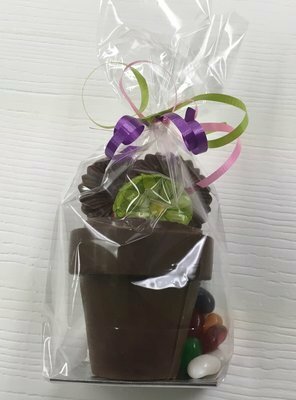 Chocolate Hot Air Balloon. Peanut & Gluten Free. 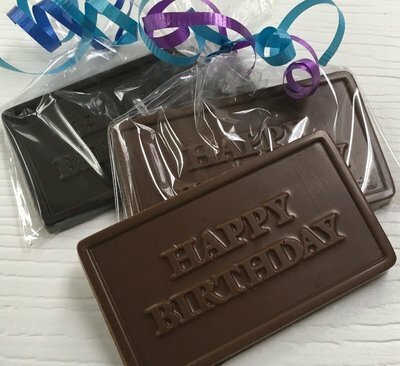 Happy Birthday Chocolate Bar. 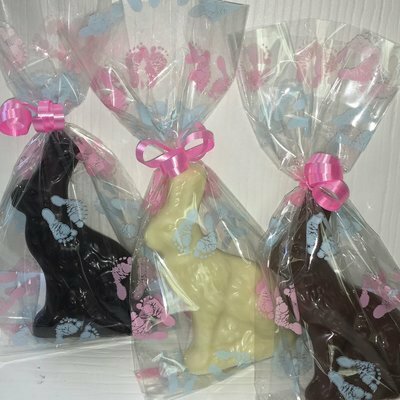 Available in Milk or Dark or Mix. 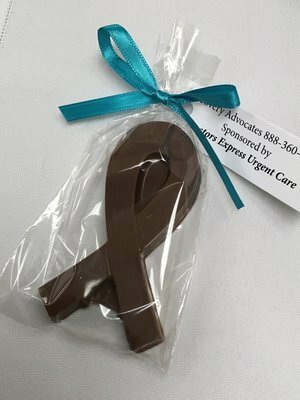 Choice of ribbon color. Peanut & Gluten Free. 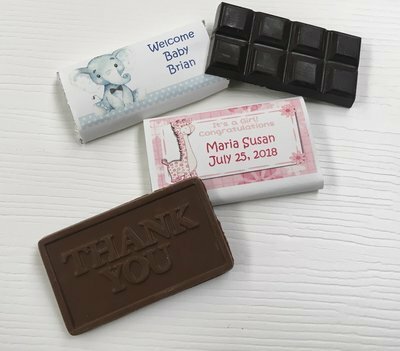 Personalized Baby Shower Chocolate Bars. 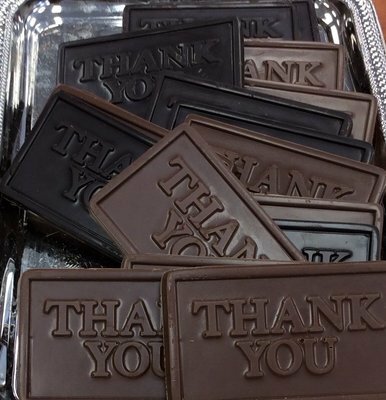 (Chocolate included) Thank you bar or Chocolate Bar. 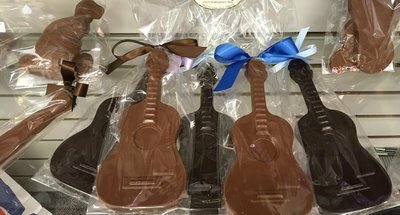 Chocolate Guitar Milk or Dark. 8 1/2" x 4". 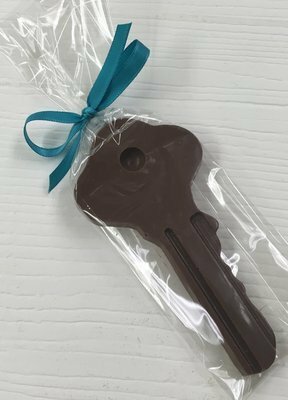 Peanut and Gluten Free. 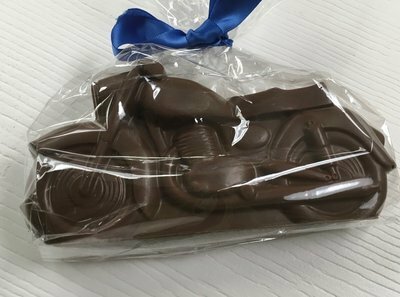 Chocolate Motor Cycle. 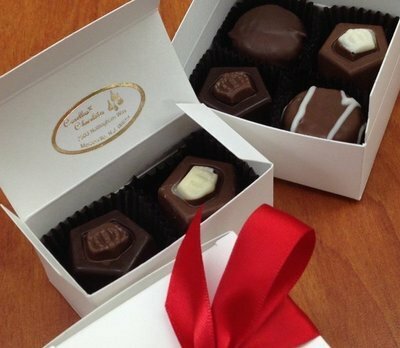 Choose Milk or Dark Chocolate. Zoom, Zooom! 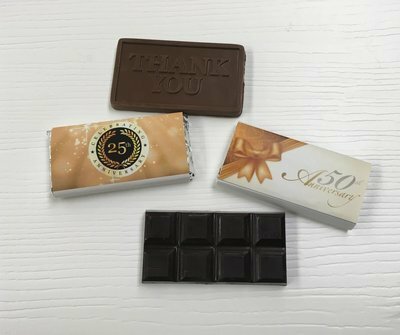 50 Anniversary Chocolate Bars. 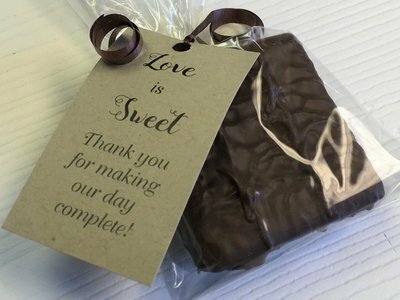 (Chocolate included) Choose from Thank you or Chocolate bar. 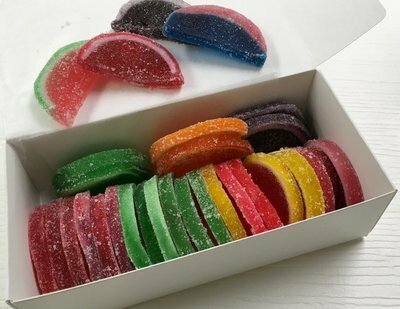 One Pound of Fruit Slices. Approx. 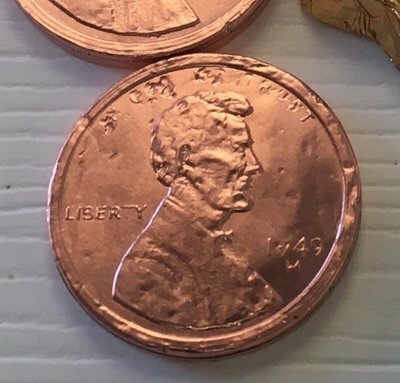 28 to a Lb. 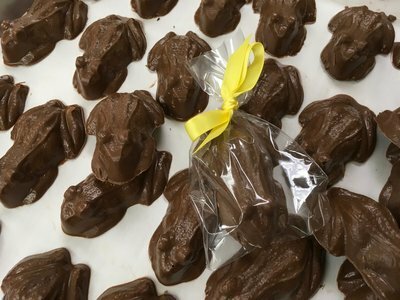 Milk Chocolate Frogs. Peanut and Gluten Free. 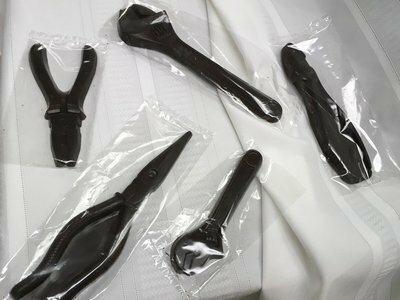 (bag and bow not included). 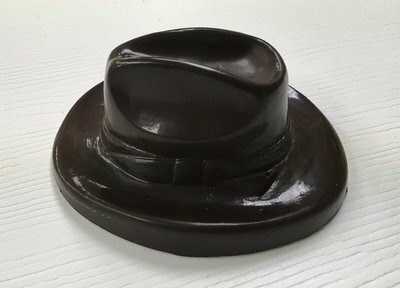 Chocolate Hat. 6"x5". Available Milk or Dark. Bagged and Bowed for a Unique presentation. 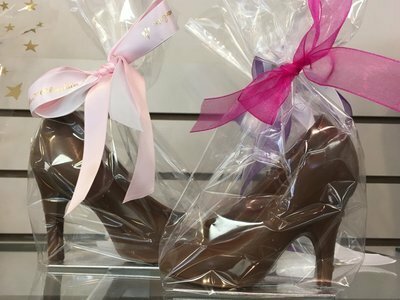 Small Chocolate High Heel. 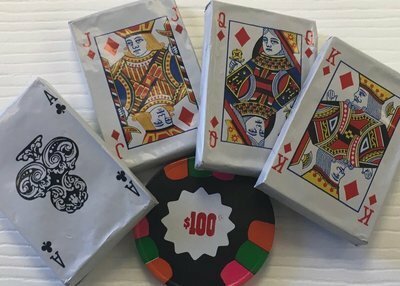 4"x4" Bagged and Bowed. 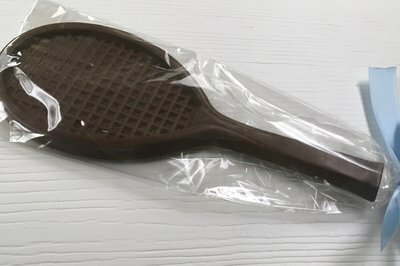 F - Large Chocolate Tennis Racquet. Peanut & Gluten Free.